While Mexico City may not have New York’s skyscrapers, it’s every bit as big — bigger — and its people every bit as busy. Urban life doesn’t always allow for a home-cooked meal. 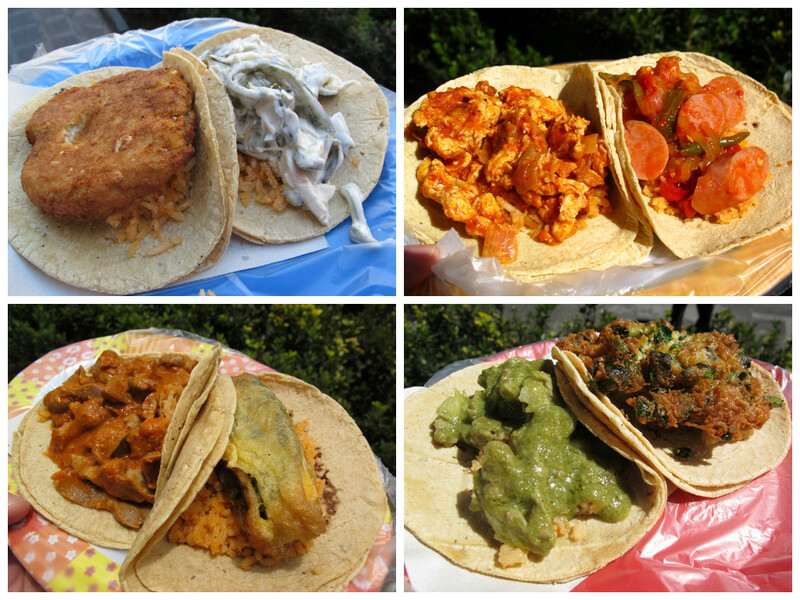 So in DF, the home-cooked meal has come to the street in the form of tacos de guisado. Guisados are comida casera — home-style dishes –, everything from stews to stir-fries to fritters. Every busy corner has at least a couple street stands in Mexico City. 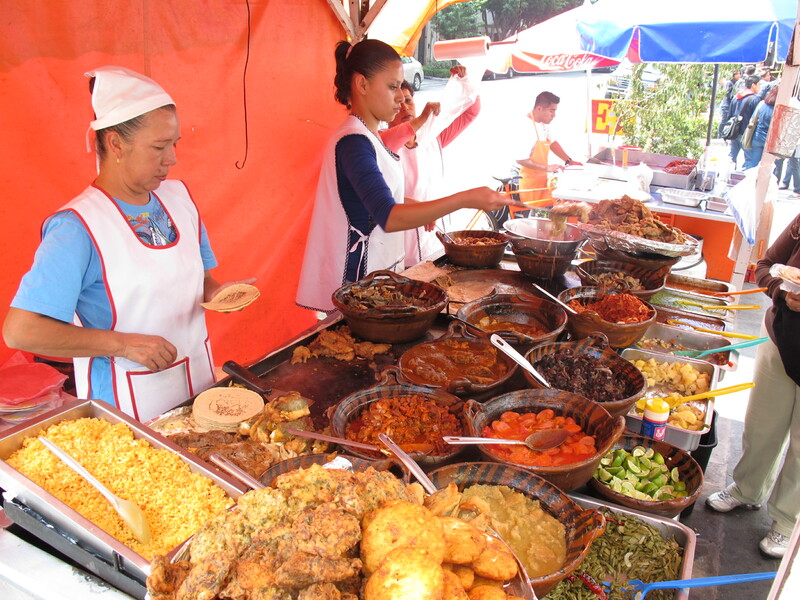 And tacos de guisado are one of the most popular types of taco stands. They’re breakfast and lunch tacos. Taquerias serving guisados will close or disappear by 3 or 4 in the afternoon. And this is just the beginning. The whole of Mexican cuisine can be served in a taco. But this is making me hungry, so let’s move on to some recommended favorites so I can go have some mole. The small, quiet hotel just outside the Zona Rosa in Mexico City where I stay most often is only a block from this taco stand. I can’t say the proximity doesn’t play a significant role in why I keep staying at the same hotel. It’s certainly not the slow internet and lack of air conditioning. On any given day, this stand outside a technical college serves just shy of 20 guisados. They always have seasonal tortitas (fritters). Two of the best were a ultra-crispy fritter of diced green beans and onions and a fritter of spinach with cubes of cheese. Like many tacos de guisado vendors, veggie-heavy offerings feature prominently, a nice respite from the greasy, meat-heavy night tacos. What separates this stand, though, is the deft hand with seasoning and flavor balance. There are many more famous guisado joints that put out a less skillfully produced product. This is a full-service restaurant in the hipster-laden Colonia Roma. I learned about it from Lesley Tellez. The family is from the state of Guerrero and the menu shows it by offering such items as pozole on Thursdays. I was expecting that. 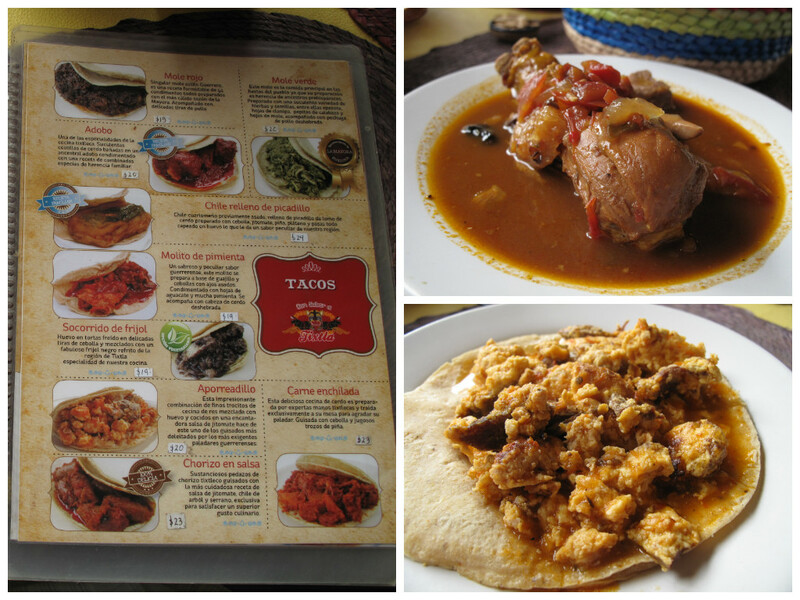 I wasn’t expecting two pages of their menu to be devoted to tacos de guisado. The apporeadillo (pictured bottom right) was a delicious combination of eggs and shredded cecina (dried beef) in a spicy tomato sauce. The pollo enchipotlado (pictured top right) was a terrific example of new old world cooking, a chicken leg stewed with sweet spices, tropical fruits, and chipotles, showing traces of Arabic and Spanish cooking. I can’t wait to make my way through all their guisados. 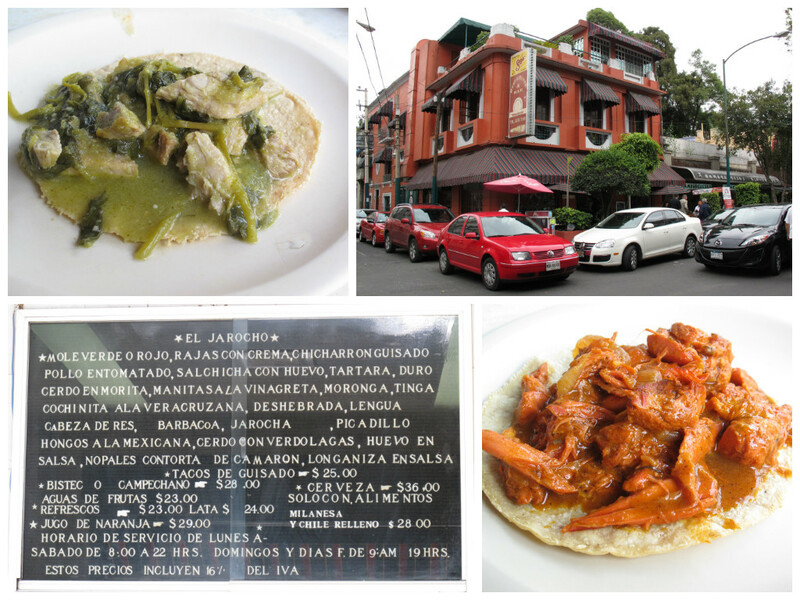 There are a handful of restaurants that make my bones ache to return to Mexico City. This is one. El Jarocho has been serving more than 2 dozen guisados for more than 5 dozen years. No matter how much we may want it to, age doesn’t guarantee wisdom and it doesn’t guarantee good tacos. Tacos Beatriz, open for more than 90 years, proves that. But the tacos at El Jarocho are worthwhile. El Jarocho does best with simple classics, like pork in salsa verde, tinga, chicken entomatado, and the like. Bonus over most of the street stands, too, is they have beer, good agua frescas, and are even open for dinner. 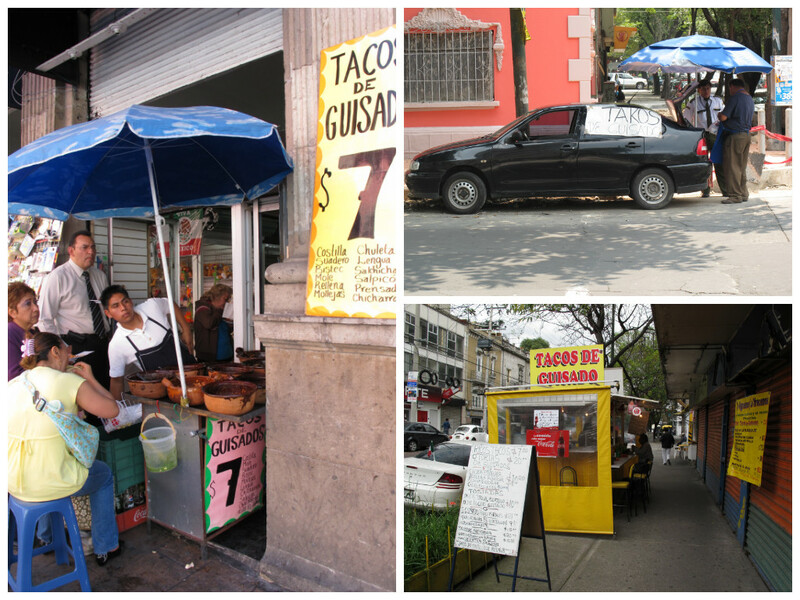 Tacos Hola is one of Mexico City’s most famous vendors of tacos de guisado. 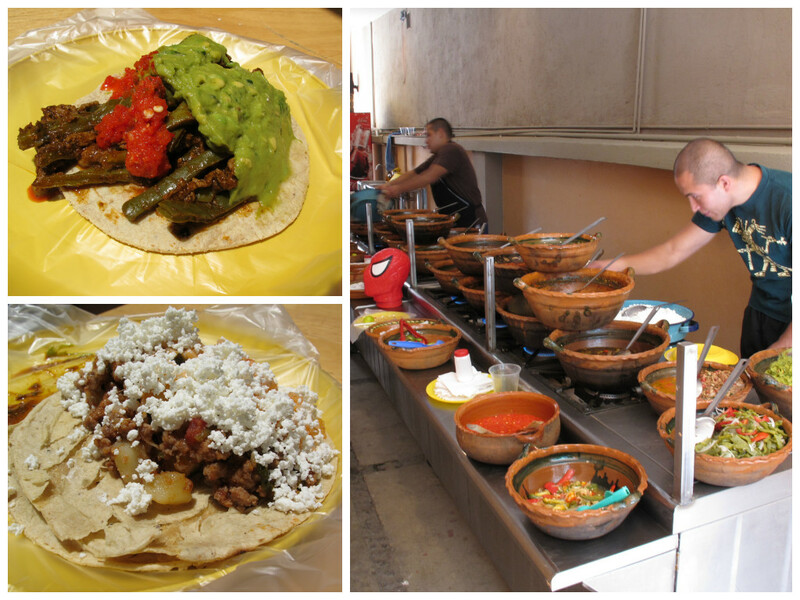 A little fonda in the Condesa where businessmen, yuppies, and workers stand shoulder-to-shoulder to order tacos, it’s easily good enough to make this list. But then Gus, son of el güero, the owner of Tacos Hola, opened his own taqueria just a short walk away emphasizing organic ingredients and selling true vegetarian and vegan guisados that were every bit as good and authentic as the meat guisados. Now he has four locations, all in hip neighborhoods. Among vegetarian guisados, the cauliflower in dark chile sauce is one his best when available. Didn’t miss the meat at all. He regularly offers a specialty of Mexico City, that is nonetheless hard to find at many guisado joints: chicharron prensado, the unctuous pork skin left after rendering lard, pressed to remove that fat, and then stewed in sauce until spoon tender. Get it. Another great thing about Tacos Gus, is that like Tacos Hola, you can get a big schmear of guac on your taco or a generous topping of crumbled cheese. Restaurants are often built on the back of one dish. And so it is with Tacos Pati*. Year-round chile en nogada tacos make a stunning dish for a street stand located on the backside of a subway station in a neighborhood populated by travesti streetwalkers at night. 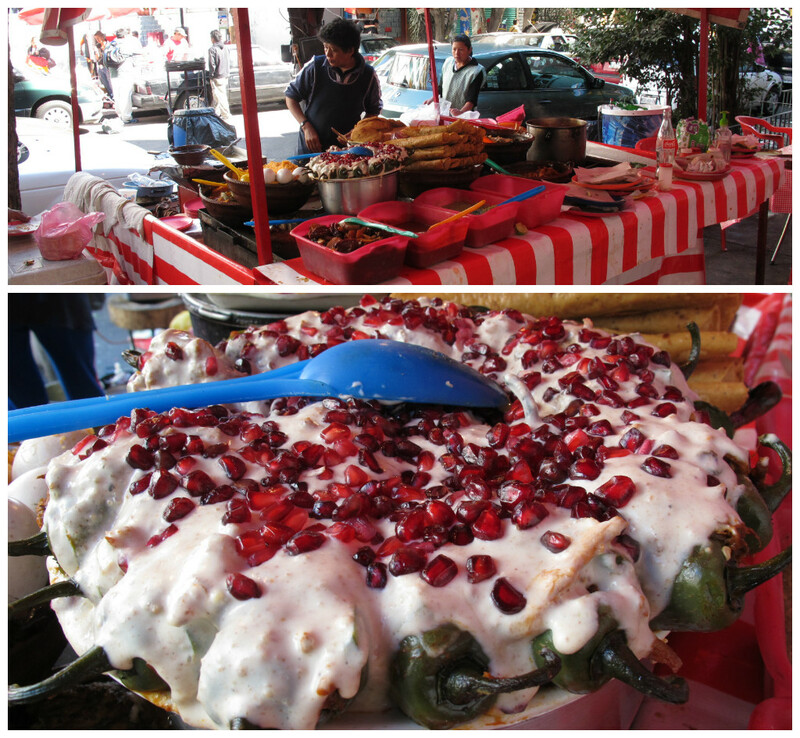 Chiles en nogada — roasted chiles stuffed with picadillo, a mixture of chopped meat, olives, fruits, and nuts, topped with walnut cream sauce and pomegranate seeds — is traditionally served to celebrate Mexican independence September 16th. Pomegranates are in season then and the green, white, and red resembles the Mexican flag. Pati uses chiles cuaresmeños, similar to a jalapeño, but milder. Her picadillo is simpler than many, but as a taco, it’s still great. Her other guisados are solid. She seems to emphasize fried items, like more typical battered-and-fried chiles rellenos, various fritters in salsa, and flautas. One of the best items is a side offered free, a mixture of sweet potatoes with garlic and chipotles. * It’s worth mentioning that there’s no sign indicating a real name for the stand — at least not on my last visit. But Pati is the one running the place and it’s easy to spot from the chiles en nogada. Great list! I want to eat my way through Con Sabor a Tixtla’s guisados, too. And their pozoles. Another good thing about Tacos Gus: you can get beer there, and sit outside on the sidewalk. Thanks Lesley — and thanks for introducing me to Sabor a Tixtla! Sitting here thousands of miles away from Mexico City at breakfast time you’ve managed to make my mouth water and I just can’t wait to be back on the streets of el DF chasing down my next street corner tacos. Great blog! Best wishes from Sydney! Those are the real tacos..Viva Mexico!! You should try this ones in Condesa. I remember when it was a carniceria and they also sold tacos, my favorites in that area. Try the Bistec con tocino.